Talkie Box, Other effects bundle or multi-effect from Digital Brain Instruments. Audiomeals has introduced Talkie Box, a new standalone sound design audio tool to emulate Radio, Walkie Talkie and Telephone effects on Mac and PC. Walkie-Talkie Emulator with distortion, 3-Band Parametric EQ, High Pass, Low Pass, BandStop and Resonance filters. Radio-Telephone Emulator that limits your frequency bandwidth and includes 3-Band Parametric EQ, Resonance & BandPass filters as well as a Telephone Dial Pad with real sounds to create your own dialing sounds sequence. 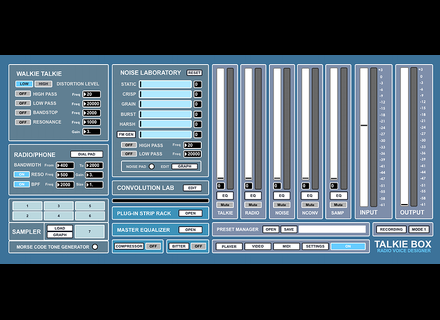 Noise Laboratory with up to 6 different noise signals, an XY pad to control FM Gen parameters, High Pass & Low Pass filters and 3-Band Parametric EQ, as well as a Noise Lab Sampler: Once the desired background noise has been designed, you can also trigger this noise as if it were a sampler via Noise Pad. Triggering envelope designer included. Convolution Lab to design your own voice noisy sounds and a dd some noise and bad reception sounds to your voice. It includes 6 different noisy sound signals, an XY Pad to control FM Gen parameters, a 3-Band Parametric EQ and an input-depending mode available that allows activating or deactivating the convolution lab sound depending the input level. Recordingto 8/16/24/32-bits & WAV/AIFF formats ; simultaneously dry/wet recording mode available which allows to process again the original source content (your voice) and apply some edits or create some variations before the final recording. Mac OS X: Intel only running OS X 10.6 or later (including 10.9). Minimum RAM 1GB. Windows: Windows XP, Vista, or Windows 7 machine with a Pentium 4 or Celeron compatible processor or higher. Minimum RAM 1 GB. [NAMM] Sonarworks calibrates your monitors Sonarworks debuted at NAMM 2014 where they introduced a new software designed for monitor calibration.